With a smile the old lady said, ‘why! Did you forget me? Every Friday I used to come to the temple of Goddess Laxmiji, when there had been singing praise of the Goddess. There we happened to meet each other!’Sheela was full of sorrow, as her husband had gone to the immoral way of life. She had stopped going to the temple of Goddess Laxmiji. She felt ashamed to get associated with others. She tried much to recollect the memory of that old lady. But she was not successful.After a while, the old lady said to Sheela, ‘How sweet you had been singing prayer of Goddess Laxmiji in the temple amidst the devotees! Now days you are not seen there. Hence I have begun to think the reason for it. At last I have come to see you’. Hearing the kind words of the old lady, Sheela’s heart moved and her eyes were full of tears. She began to sob painfully. The old lady moved near her and began to console her striking lightly on her back with love. Hearing the consoling words of the lady, Sheela’s heart felt peace and comfort. She said to her, ‘We were very happy in our life and enjoyed ourselves with the bliss in our heart. My husband was also having a good character. By the grace of God, we wee pleased with our financial position. We used to utilize our time in worshipping God. But by our ill luck, my husband was influenced by his bad company. At last he ruined the life by going on the path of immorality: drinking wine, speculation, gambling, race, intoxicating drugs etc. As a result we have become as good as beggars of the footpath’.The old lady said, ‘Dear, happiness and sorrow come one after the other. Moreover the end of the misdeeds is strange. Every man has to suffer the consequences of his good or bad deeds. Now don’t get worried. You have already suffered all the consequences of your husband’s misdeeds. Now, you will have happy days of your life. You are the devotee of Goddess Laxmiji. Goddess Laxmiji is the incarnation of love and compassion. She is very merciful to her devotees. Hence, have patience and observe the Vrat of the Goddess Laxmiji and your life will be quite easy-going.’Having heard about the observance of the Vrat of divine Goddess Laxmiji, Sheela’s face glittered with light. She said to the old lady, ‘Mother! Kindly tell me how the Vrat of Laxmiji can be observed. I will certainly observe it.’The old lady said, ‘The Vrat of Laxmiji is very easy to follow. It is called the ‘Vaibhava Laxmi Vrat’ (Vrat giving wealth) or ‘Vaibhava Laxmi Vrat’ (Vrat giving Luxury). All the hopes of the person who observes the Vrat, will get fulfilled, and she or he becomes happy, wealthy and reputed’. Then she began to describe how to perform the Vrat.‘Dear, this Vrat is very simple and easy to observe. Many people observe this Vrat by the improper method. Hence they don’t have good result. People believe that the Vrat can be observed only by applying yellow and red turmeric to golden ornaments. But it is not so. Vrat should be performed with proper ceremony according to the religious scriptures or shastras. Then only the observance of the Vrat becomes fruitful. The celebration of the Vrat also should be performed as prescribed by the shastras with proper ceremony’.‘The Vrat should be observed on Friday every week. One should put on clean clothes after taking bath and should utter silently ‘Jai Ma Laxmi’. One should not speak evil of others. Having washed hands and feet in the evening, one should sit on the wooden seat facing the east direction. One should put a big wooden seat, and then one should put a copper pot on the small heaps of rice arranged on the handkerchief spread on the wooden seat. One should keep gold or a silver ornament or a rupee coin in a small bowl placed on the copper pot. One should light the lamp-stand and the incense stick near the wooden seat.”“There are many incarnations of Goddess Laxmi.” A person observing the Vrat of Vaibhava Laxmi should devotedly see ‘Shree mystical diagram’ and various complexions or forms of goddess Laxmiji. Then one should sing the prayer of Laxmiji. Afterwards one should apply the ornament or a rupee-coin with the yellow and red turmeric and rice-grain. Then after adorning it with a red flower, one should wave lights keeping sweets or piece of jaggery and should utter ‘Jai Ma Laxmi’. After the rituals one should offer the prasad among the members of the family. That ornament or a rupee-coin should be put to the safe place. The water kept in the copper-bowl should be poured into the pot of basil-plant [tulasi] and the rice grain should be thrown to the birds. In this way one gets his or her desires fulfilled by observing the Vrat according to the prescribed ceremony of the shastras. A Man gets wealthy by the grace of Goddess Laxmiji. An unmarried girl gets married. The married woman maintains the happy state of wifehood and a childless woman gets a child by the influence of observance of the Vrat.Sheela was pleased to know about the observance of the Vrat from that old lady. She said to her, ‘Mother! You have shown me the ceremony of the Vrat. Now I will surely observe it. But please, tell me how long this Vrat should be done and how it should be celebrated’. The old lady said, ‘People say that this Vrat can be done in one’s own way. But it is not so. This Vaibhava Laxmi Vrat should be done for eleven or twenty-one Friday. On the last Friday, the Vrat should be celebrated offering a coconut and sweet dish of rice. Then on that day the sweets should be given to seven unmarried girls or ladies, and saying…’Jai Ma Vaibhava Laxmi’ they should be given a book of ‘Vaibhava Laxmi Vrat’. Afterwards you should bow down your head to the photograph of Goddess Dhanlaxmi and should pray in the heart! Mother! I have observed the Vaibhava Laxmi Vrat. Please fulfill all our wishes! Kindly give wealth to the poor and give children to the childless woman. Let the married woman enjoy the happy state of wifehood. Let the unmarried girl fulfill her desires. Please have grace on those who observe your Vrat and be kind to them by favoring happiness in their lives’. By praying in this manner, bow down your head to the Dhan Laxmi, incarnation of the Goddess Laxmiji and Keep your hand above (not to touch) the flames of the lamp and apply it to your eyes’. Hearing the ceremony for the observation of Vaibhava Laxmi Vrat, she closed her eyes and decided in her mind to do the Vrat with full faith according to shastras for twenty-one Friday and to celebrate the same with ceremony. When Sheela opened the eyes, she was very much surprised to know that the old lady had disappeared! That old lady was no one else but Laxmiji Herself! As Sheela was the devoted worshipper, Goddess Laxmiji Herself had come in the form of an old lady to show Sheela the path of happiness.On the very next day it was Friday. After taking bath Sheela began to utter, ‘Jai Ma Laxmi’ with full faith in the Goddess Laxmi. During the day she didn’t defame any one. In the evening having washed her hands and feet, Sheela placed the wooden seat. She put her nose-ornament in the small bowl placed on the copper pot, which was on the heaps of rice arranged on the handkerchief spread on the wooden seat. Sitting in the east, Sheela observed the Vaibhava Laxmi Vrat with proper ceremony as informed by that old lady. Then she offered some sugar to her husband. Immediately there was a great change in her husband’s nature. As usual her husband did not beat her! She was very much happy to see such miraculous change in husband. Then after observing the Vrat with devotion and faith for twenty-one Friday. Sheela celebrated the last Friday. She gave a book of Vaibhava Laxmi Vrat to seven ladies and bowing down her head to the photograph of Goddess Laxmiji, prayed: ‘Mother! I have finished observance of the Vrat today. Kindly fulfill the desires of the unmarried girls and return the happiness of those who observe the Vrat. Be merciful to bless us with bliss of life uttering, “Give wealth to the poor, a child to the childless woman and preserve the happiness of the married woman. Kindly fulfill the desires.” Uttering these words, Sheela kept her hands above the flames of the lamp and applied her hands to her eyes and paid homage to the Goddess. In this way, Sheela could get the result as she had observed the Vrat according to the prescribed ceremony of the shastras. Her husband gave up the immoral way of life and began to earn with great efforts. With the pious power of the Goddess, her husband became wealthy. He got back the ornaments of Sheela mortgaged by him. Hence forward he became a noble man and Sheela regained the peace and happiness in her life as before.Having seen the pious power of the Vaibhava Laxmi Vrat, other women of the street began to perform the Vrat according to ceremony described by the shastras.Oh! Goddess Dhan Laxmi! Be merciful to all, as you had been to Sheela. Fulfill the desires of all. Bless all with peace and bliss. Jai Ma Dhan Laxmi! Jai Ma Vaibhava Laxmi!!. If married women observe this Vrat, they achieve the award. If there is no married woman in the family, any woman or unmarried girl can observe this Vrat. If a man observes this Vrat instead of a woman, he also achieves the award in the same way. One should observe this Vrat with full faith and pious conception, not by dislike or without intense desire. Vrat should be observed according to the rites prescribed by Shashtras for eleven or twenty-one Friday as per one’s oath. It should be celebrated according to Shashtras performing proper ceremonies after the observance of Vrat on Friday as decided at the time of the oath. This ceremony is very simple to be preformed. If the Vrat is not observed according to proper ceremony described by the Shastras, one does not achieve its award or fruit. After having once observed the Vrat, it can be observed again taking the oath devotedly. Goddess Laxmiji has innumerable incarnations. Among all, ‘Shri Yantra’ Amulet of Goddess Laxmi is very beloved to her. 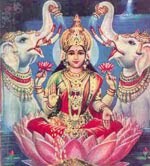 Her incarnation of Dhan Laxmi itself is Vaibhava Laxmi. One should bow down one’s head to each and every incarnation of Goddess Laxmi given above. And also, while observing the Vrat one should pay homage to Shri Yantra. Then only it is fulfilled. If one doesn’t want to take the least trouble to observe Vrat, Goddess Laxmi also doesn’t take any trouble for her or him and she doesn’t show any mercy to such person. On the day of observance of the Vrat, from morning one should utter ‘Jai Goddess Laxmi’ or ‘Jai Ma Laxmi’ at heart as many times as possible. If one has to go on tour or outside the residence on Friday, one should observe the Vrat the next Friday at one’s residence only. One should observe the Vrat for as many Friday as decided by oneself at the time of oath. The silver ornament should be utilized if one has no golden ornament for observing the Vrat. One should place a rupee coin if one has no silver ornament. f the woman is in menses or having ceremonial defilement and consequent untouchability owing to death in the family on the Friday, one should observe the Vrat the following Friday. And at the end, one should observe the Vrat for as many Friday as decided at the time of oath. In the beginning of observing the Vrat, one should recite once the hymn or praise the Goddess Laxmi. One should be on fast on the day of observing the Vrat on Friday, and should eat the sweet dish offered to Goddess Laxmiji. One may eat fruits or take meals once a day. The weak persons may observe the Vrat having food twice a day. The important thing is that one should have full faith and devotion in Laxmiji that Goddess would certainly fulfill the desire. Most important point to note is one doing the Vaibhav Lakshmi vrat should do it with full faith, and emotion. Confidently pray taking an oath that Mother will fulfill my desire.